Welcome to the JMH/UM Internal Medicine Residency Program. I had the great fortune to join the JMH/UM Internal Medicine Program Family in 2008 as the Med-Peds Residency Program Director and as a faculty member in General Internal Medicine. 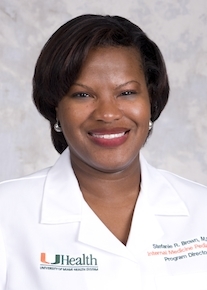 In June 2015, I accepted the honor of the appointment as Program Director for Internal Medicine. Our Internal Medicine Residency program is special because of its diversity as evidenced by our patients, the pathology, the curriculum and career development opportunities, only outshone by the diversity of the city itself. Our residency training is conducted in 3 very different health systems all located in the “Health District” in Miami. The Jackson Health System is the safety net hospital system for Miami-Dade County, the University of Miami Health (UHealth) System is a private not-for-profit health system and the home of our medical school and the Miami Veterans Affairs Medical center provides federally funded health care for the men and women of our armed services branches. This variety of experiences is a definitive element in becoming a confident, knowledgeable, compassionate and resourceful internist and affords residents the opportunity to work with patients from different cultures, countries and socioeconomic statuses. Our location and institutional mission is to provide care for not only our local citizens, but also to the international community as a referral center for Latin America and the Caribbean. All of our institutions are teaching hospitals with residents and fellows acting as the primary providers of clinical care. At JMH, our parent institution, this often means literally providing the first and only care that many of our patients receive. Serving the underserved and the “never served” regardless of the ability to pay is our mission. We are lucky enough to share faculty amongst all 3 health systems - faculty who are leaders in their field and most importantly passionate about education and clinical care. JMH and UM are partners not only in clinical care, but also in cutting edge innovations in research providing residents with an endless diversity of opportunities. We know our program offers the depth and breadth of experience necessary to allow graduates to achieve their desired professional goals. We have striven to provide a friendly, open, and supportive environment that emphasizes academic excellence. I truly view the opportunity to work within the Jackson Health and UHealth systems as an honor and a privilege due to the incredible and inspiring diversity of pathology, patients, residents, faculty, curriculum, and research. We are proud to offer you a chance to see a program bursting with innovation and opportunity in a family-like atmosphere. We invite you to visit with us so you can fully appreciate the excitement, enthusiasm and pride that we share in our residency program.